Yesterday I had the pleasure of attending an EBSCO roadshow event, which covered their recently acquired Plum Analytics service (thanks to Michael Ladisch for the invitation). Plum Analytics launched back in 2012 on the back of Jason Priem’s rationale around Altmetrics (see the manifesto for more), the idea being that traditional filters of scholarly communication (peer-review, citation counting, JIF) are simply not sufficient (and transparent) enough to account for what’s actually happening out there on the Web, which forms part and parcel of modern scholarly communications. EBSCO jumped right into the mix here and now aims to offer a comprehensive metrics service through the aggregation of traditional metrics and alternative metrics in a side-by-side view context (they call this ALLmetrics). Example sources include the likes of Amazon, Bit.ly, CrossRef, Delicious, Dryad (for data sets), dSpace, ePrints, Github, USPTO, Scopus, Stack Overflow and more… This list is added to with new sources as they bubble to the surface and establish themselves. 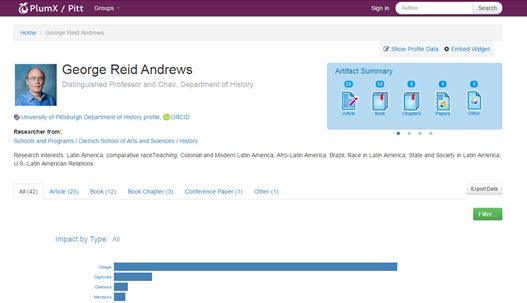 In a nutshell, EBSCO’s Allmetrics goes beyond traditional citation metrics and aims to offer a more holistic view of how researchers’ outputs are communicated and ‘used’. It does so by considering a multitude of popular digital environments where scholarly outputs feature. The University of Pittsburgh was the first institution that adopted this service – PlumX/Pitt. Below is a screenshot of one of their academics and his scholarly footprint. EBSCO’s full presentation is available here. See https://plu.mx for more on PlumX. At this point in time, no higher education institution in Ireland has adopted this service. It will be interesting to see who will take the leap first. As part of the wider discussion around Altmetrics, you also might want to consider Featherstone, R. f. (2014). Scholarly Tweets: Measuring Research Impact via Altmetrics. Journal Of The Canadian Health Libraries Association (JCHLA), 32(2), 60-63.